A solid night for ABC’s sitcoms. ABC: THE CONNERS seems to have found its footing, up 0.1 to 1.8, and THE KIDS ARE ALRIGHT gained 0.2 to 1.3. 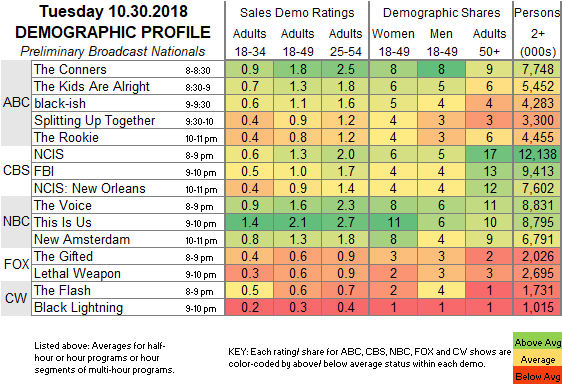 BLACK-ISH (1.1) and SPLITTING UP TOGETHER (0.9) were also up 0.2. However, THE ROOKIE lost 0.1 to 0.8. NBC: THE VOICE (1.6) and THIS IS US (2.1) were steady. NEW AMSTERDAM slipped 0.1 to 1.3. 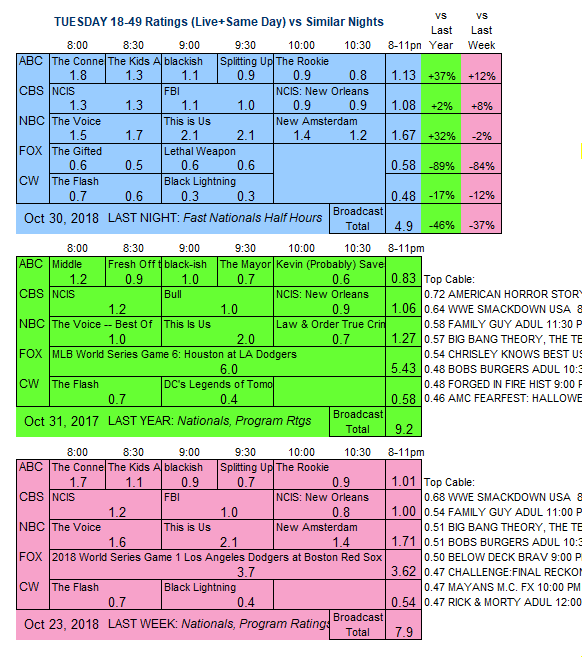 FOX: After a World Series break, THE GIFTED remained at 0.6, while LETHAL WEAPON was down 0.1 to a new low 0.6. CW: THE FLASH (0.6) and BLACK LIGHTNING (0.3) were each down 0.1. CBS: NCIS (1.3) and NCIS: NEW ORLEANS (0.9) were each up 0.1, and FBI was steady at 1.0. As is its custom, CW will take Halloween night off, since much of its target audience won’t be watching TV tonight.